At Vesleøksna we specialize in breeding the standard sized smooth-haired dachshund also known as Tachs. Further, we breed Danish-Swedish Farmdog. We do regulary have litters. If you are interested in buying a puppy, please contact Gro at (+47) 99107907 for more information. The Dachshund is a short-legged, elongated dog breed of the hound family. The breed's name is German and literally means "badger dog" (der Dachs - badger; der Hund - dog). The breed was developed to scent, chase, hunt, and kill badgers and other hole-dwelling animals. Due to their long, narrow build, they are sometimes referred to in the United States and elsewhere as "wiener dogs" or "sausage dogs". A full-sized Dachshund averages 12 to 24 lb (5 to 10 kg), while the Miniature variety typically weighs less than 12 lb (5 kg). 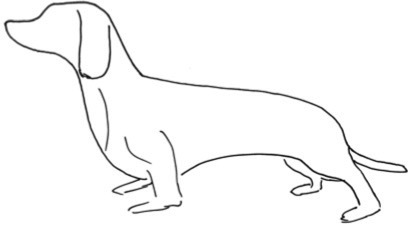 Modern Dachshunds are characterized by their crooked legs, loose skin and barrel-like chest, attributes that were deliberately added to the breed to increase their ability to burrow into tight spaces. They come in three coat varieties: Smooth, Longhaired and Wirehaired; the Wirehaired variety is generally shorter in spine length than the other two. H. L. Mencken said that "A dachshund is a half-dog high and a dog-and-a-half long," which is their main claim to fame. The first verifiable references to the Dachshund, originally named the "Tachs Kriecher" (badger crawler) or "Tachs Krieger" (badger catcher), come from books written in the early 1700s. Prior to that, there exist references to "badger dogs" and "hole dogs", but these likely refer to purposes rather than to specific breeds. The original German Dachshunds were larger than the modern full-size variety, weighing between 30 and 40 lb (14 to 18 kg), and originally came in straight-legged and crook-legged varieties (the modern Dachshund is descended from the latter). Though the breed is famous for its use in exterminating badgers, Dachshunds were also commonly used for rabbit and fox hunting, for locating wounded deer, and in packs were known to hunt game as large as wild boar. Dominant colors and patterns include Red and Black & Tan. Older traditional patterns such as piebald and sable are recently gaining in popularity. Recently, other color and pattern combinations have been developed; it is not uncommon to see Dachshunds with Brown & Tan, Chocolate & Tan, dapple, double dapple, and even white coats. Unfortunately, some of these colors require extensive inbreeding to obtain; double dapples are often born eyeless or with severely underdeveloped eyes. For this reason, the double dapple coat is extremely disfavored among responsible breeders and owners. According to kennel club standards, the Miniature variety differs from the full-size only by size and weight. Dachshunds are loyal, playful fun dogs, known for their propensity to chase small animals and birds. According to the American Kennel Club's breed standards, "the Dachshund is clever, lively and courageous to the point of rashness, persevering in above and below ground work, with all the senses well-developed. Any display of shyness is a serious fault." Coat type is often considered to be associated with characteristic temperaments; the long-haired variety, for instance, is considered to be less excitable than the other types because it was cross-bred with the Spaniel to obtain its characteristic long coat. Some who own long-haired Dachshunds might disagree with this statement, however. Because of the breed's characteristic barrel-like chest, the dachshund's lungs are unusually large, making for a sonorous bark. 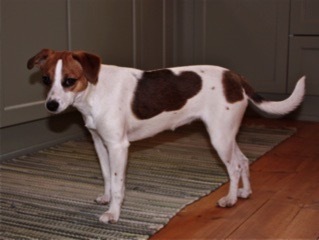 The Danish Swedish Farmdog (recognized by the FCI since 2009) is a small - medium sized terrier-like dog that has occurred in Denmark and Sweden, where it is considered a typical farm dog. The breed was formerly called "Skåne-terrier" in Sweden. The origin of this dog is unclear, but it seems as if at least a few terrier types must have been central in its development. It is very similar to a Jack Russell terrier, but it will have a far milder temperament. The breed has probably been around very long, but just how long, is not known. The dog has, however, been common on farms in Skåne, Denmark and northern Germany. The breed was recognized by the SKK in 1987 and is probably on its way to being recognized by the FCI.